What are your favorite things to get at Trader Joe's? I love browsing through the aisles looking at everything they have to offer. It seems like there is always something new, and the staff at my local TJ's are more than willing to open a package of something to let you try it before buying (works every time, too). I have a few favorites that I get on every trip - the cereal bars, salsa, the frozen organic brown rice, and the dog treats (my dog literally fidgets and howls at us when she sees that big box of TJ's dog cookies come out of the pantry). Recently I have added something else to my favorites list - the bag of frozen Asian Vegetables for stir fry. I don't use the sauce that comes with it, but for $1.69 I love the convenience of a bag of assorted veggies - corn, sugar snap peas, broccoli, petite green beans, water chestnuts, red bell peppers, and mushrooms - chopped and ready for a quick stir fry. I use fresh veggies most nights, but for the price and convenience you just can't beat these. A few weeks ago I wanted to do a chicken stir fry with the veggies and some Thai flavors. 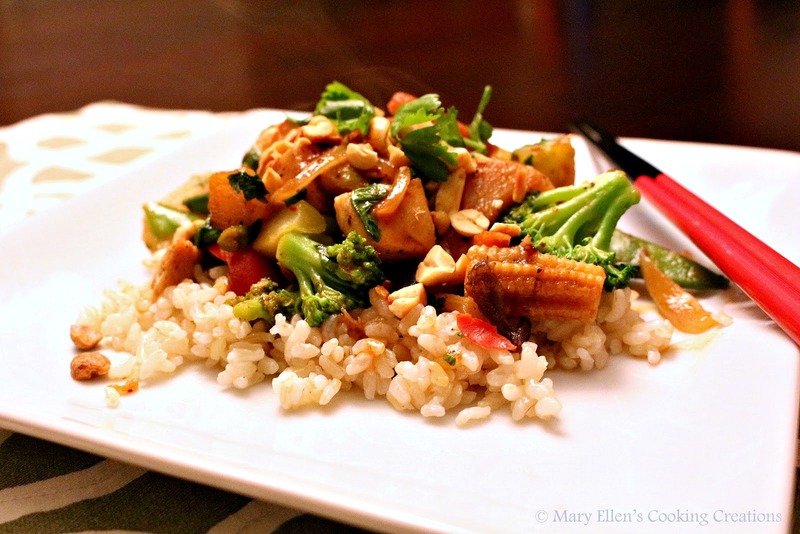 I ended up adapting a recipe for Chicken Stir Fry with Thai Peanut Sauce that I found on Well Plated. I changed some amounts, added/removed some ingredients, updated the cooking method and ended up with a dish that we all devoured! The sauce was sweet and spicy, the dish was so colorful, and the peanuts added great texture. My only wish was that there was more sauce, so next time I'll add some chicken broth. In a small bowl, whisk together the peanut butter, water, brown sugar, soy sauce, Sambal, rice vinegar, and red pepper flakes. Set aside. Heat the olive oil in a large saute pan over medium-high heat. Season the chicken lightly with salt and pepper and add it to the pan. Cook, stirring every minute or so, until the chicken has cooked through. About 6 minutes. Remove chicken from the pan. If your pan is dry, add 1 Tbsp olive oil. Add the onion; saute 2 minutes. Add the garlic and ginger; stir. Add the sauce and some of the cilantro; stir. Return the chicken to the pan and stir to combine everything.